I hate turkey. Why do we eat it at Christmas and what can you have instead? When writing this article, I called the document ‘I hate turkey’. And I do – to eat, I mean. Such a big, dry dodo of a thing. I know lots of people love it – and good for you; if eating the equivalent of reconstituted sawdust and plasterboard covered in sweaty bacon is your idea of a tasty treat then fill your boots – Christmas offers you the perfect excuse to tuck into that saliva-sucking chew-fest. And don’t try to tell me that it’s about the way you cook it. I’m sure there are ways of making it less like a Bushtucker Trial, but even if it wasn’t so dry it renders you speechless, it still tastes of pretty much nothing. And damn it’s ugly. Me, I like something with a bit more flavour (and moisture). And dare I say, something a bit more British, although that’s a complicated construct, but anyway. Let’s kick off by explaining that no, it’s not really America’s fault that we eat turkey at Christmas. Because I hear that one a lot. The turkey, a bit like the chicken, was originally a luxury item on the British Isles. Although the bird does originate from North America, gobbling along from Canada to Mexico, it was originally seen as dinner table bling if you could get one, and our eating it at Christmas is not an extension of the US’s thanksgiving seeping into our culture. Historically, through the 16th and 17th centuries in Britain, goose or capon was commonly served, and the rich sometimes even dined upon peacock and swan. 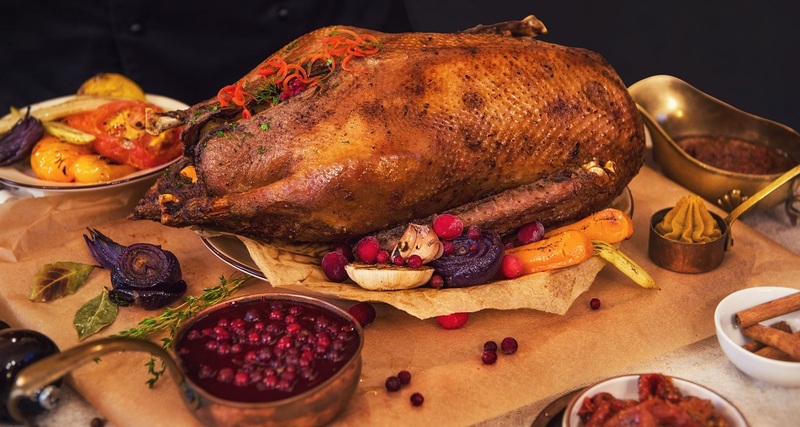 Goose today is increasingly popular again, and clearly a bit posh, with a sales rise of 30% in supermarkets and something like 45% in Selfridges, but it takes different handling. I did goose last year and struggled with the oiliness in the gravy but there are ways of making that better, I just didn’t research it properly. The meat was really lovely though. The turkey really only appeared more regularly on Christmas tables in England in the 16th century, and popular history reports that King Henry VIII was the first English monarch to have turkey for Christmas. Whether or not that’s true I don’t know – and who cares really. It became more popular largely because it was big, and fed a lot of people, and, well, here we are. It became really prevalent around the fifties, when you could shove something that large in a fridge and keep going back to it. For days. Something like 10 million turkeys are eaten in the UK over Christmas. And a lot of them aren’t treated very well before they hit your table but that’s another story. Curious to see how perverse I am or how popular the turkey is, depending on the way you look at it, I posted on my Facebook page about the joyless big bird, imagining that most people love it. But no! Apart from the fact that a growing number of friends are vegetarian or vegan and haven’t the slightest interest in eating anything with a wattle, a large number of my mates are tucking into (in order) goose, beef and venison, with some other variations. My Scottish mate Gail is literally having all three, AND some haggis action; “Venison, Beef Wellington, goose,” she says. “Haggis isn’t grand enough for Christmas dinner. We will often serve haggis as stuffing with whisky sauce though.” I don’t think she means all on the same day, but if she does; well that’s me seriously impressed. Actually I wish I was going to Gail’s for Christmas Day. Vegetarians are keen on stuff in pastry. Rose Collis is the only one plumping for a Quorn roast (I’ve had one of those and it’s actually really not bad at all) but largely the Vs are going for some kind of fluffy parcel, encasing stuff like cheese, broccoli, mushrooms, nuts etc – all of which sound way nicer than turkey. It’s really interesting hearing what friends living abroad or who have non-Brit other halves have – a friend who wishes to remain nameless for fear of Christmas homicide says, “We are in Norway so it’s pork belly. It’s really good. Unless you are the nameless relative who cuts off all the fat and skin and boils the meat before roasting it. We don’t eat with them, mind.” Egad. Jason has a Slovakian wife, Lenka, and they eat the most extraordinary feast. “Surf and turf or duck and dauphinoise on Christmas Day. Fish on Christmas Eve, which is main Christmas for non-English speakers anyway, usually sea bass. We also have a fierce cabbage and mushroom and smoked meat soup which is traditional. Oh and a big plate of homemade sausages.” Wow. And Esta – who is Jewish but has an American Italian missus, has “a Sicilian Christmas lunch because she is Italian American and her family are all originally from Sicily. So it’s antipasto with all the usual grilled vegetables and olives etc, then manna cotta which is huge tubular shells stuffed with ricotta cheese smothered with a garlicky herby tomato sauce, and a homemade fried meatball dish, and people who aren’t vegetarian usually add that to the pasta with ricotta as a side.” Apparently, usually in America on Christmas Day you eat the dishes from whatever your cultural background is as they’ve all had enough turkey from Thanksgiving. There’s more, I could go on for yonks – Elisa has lobster and chips, which I’m definitely interested in – and pretty much everyone agrees there should be a ‘side ham’ for snacking on. Yossarian says their lot have a capon, which definitely has legs. “It’s the same size as a turkey, but tastes like chicken,” he said. Win. Anyway, whatever you eat on Christmas Day, try and enjoy it. Even if it’s turkey. We’re going for beef this year, and couldn’t decide between Wellington or something slow cooked, so sod it, we’re doing both. Happy holidays everyone. Moreish melt in the mouth beef that’s had a natural grass-fed diet. 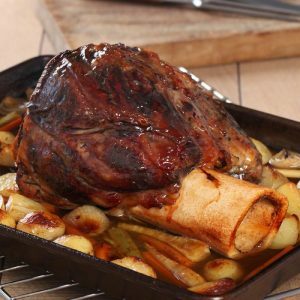 Already slow-cooked for 13 hours bringing intense tenderness, you literally just finish in your own oven from frozen to bring out that deep, meaty flavour. They’ve done the hard work so you can relax. Total winner.